There are just a few days left in February and my 6th Blog Anniversary Celebration and Giveaway is drawing to a close. It's been such fun to read all of the answers to the questions. If you have a chance, I hope you will take the time to see what some of the other readers have shared in their comments. This is the digital page that I did for the Layout a Day (LOAD) challenge today. We were given an interesting challenge to mix up the order in which we ordinarily do things by throwing a die or drawing numbers. There were six steps of the process defined and we had to do them in a random order. 1. Design - chose a template. 2. Photo - found this old photo from my childhood. 3. Story - wrote out the story about our stockings. 4. Paper - it took a long time to figure out papers for the template and I made some of them myself. 5. Little Stuff - added the snowflake overlay. 6.Title - well that was pretty easy at the end! Mom made these huge red flannel Christmas stockings for our family with white rick-rack trim spelling out our names on the cuffs. The stocking always contained fruit (including a large grapefruit at the toe) nuts and small gifts. There might be a special chocolate bar but most of the other items were "things" like a hair barrette, small puzzle or some other game - she collected stocking items all year long. Some years all of the individual gifts inside the stockings were wrapped but that didn't happen every year - it depended on the amount of cookie baking that was necessary that year. I don't know what happened to these stockings. It would be great to find the pattern and make some for our family. I have lots of fond memories of those stockings. It's too bad that they have disappeared. I wish I had better photos of the stockings in use (I might find some in my Dad's photos eventually). I use the Artisan software from Panstoria for my digital pages. This used to be sold as StoryBook Creator by Creative Memories. It's easy to use but it also has lots of fairly sophisticated options if you like to try different designs and effects. 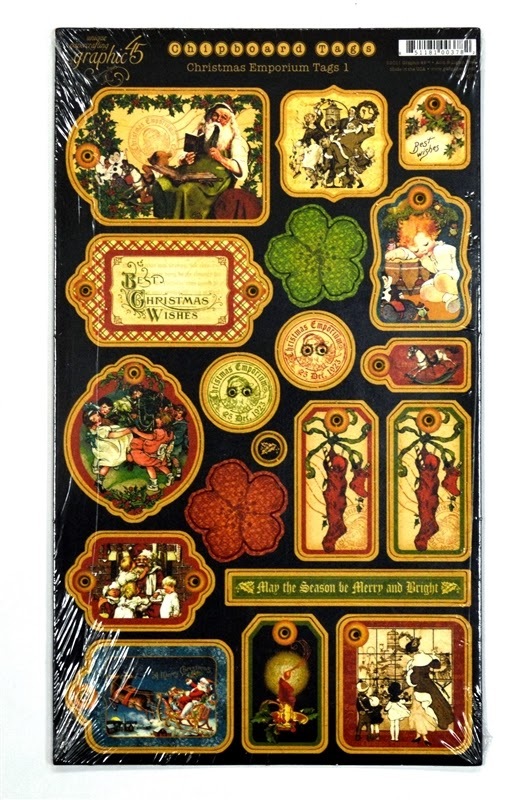 I realized that there were not any Christmas items in the boxes so I decided to add these chipboard tags from Graphic 45. I really enjoy the nostalgic style of the Graphic 45 products. If you don't use these on a project, you could just use most of them as gift tags in December. If you don't celebrate Christmas, these might be a nice little gift for a friend who could use them. I'll have to do a test pack of the actual boxes these gifts will be sent in (remember, I have to use the medium box to fit the large paper pad and the rest of the things will fill in around the edges). Then I'll know just what else I can add in these last few days. Is there a holiday tradition from your childhood that you'd like your family to carry on? Sometimes the rituals and customs from our holiday celebrations can be a great comfort as you remember the older family members who started the traditions. Do your traditions center around food, activities or both? Have you created any pages or albums to record these customs and traditions? I hope you are having a great week. They say more snow is coming - I hope it goes right past us! We had always gone to Christmas Eve Candlelight Service. Our Christmas is full of multi-generational traditions. We added the Elf on the Shelf and reading the original Clement C. Moore on Christmas eve for our son. Food and activities throughout December. I put together a digital photo album of Christmases over the years. Fun to look through. My hubby's family opened gifts on Christmas Eve and we always opened them on Christmas morning. We still do it that way. I still fix "mom's" Christmas dinner each year. We still wake up to see what Santa brought overnight. Love the stockings. Here in the South, at least where I live, we don't stuff our turkeys. We make cornbread dressing. One of our traditions is for every family member to get a spoon and taste the dressing before it is baked to make sure it is seasoned just right. They might tell me, "Needs more sage." While I'm adding more sage, they're busy getting more spoons so they can have another taste. It's a fun thing we do and I have lots of pictures through the years. I haven't been into scrapbooking much. I keep thinking I need to start. One of the traditions that we do is to hang our stockings on our mantel in preparation for St. Nick. When the kids were little, they would be so excited to see what St. Nick would put in their stockings. Well, the kids are gronw now but still hang the stockings. Even the dogs have a stocking that has treats in it. They even know which stocking is theirs. I haven't scrapbooked this though. Maybe next year. I love Christmas and remember our stockings were always filled with apples oranges nuts and a few candies. I passed this on to my girls and added coloring books and colors barrettes small gifts that would fit in stockings. My girls still do it. I try to make several layouts for Christmas for myself and my mom and my girls. Love your page! My mom made all of ours in corduroy with our initials. Actually 2 had L's and two had S's, two green and two were red. This way we switched each year red then green. I still do stockings for the kids and now mom and dad too. Everyone loves stocking time Christmas morning. I too collect items throughout the year. I have not made a Christmas page. It's on my to do list :). The tags would be great to get started with. When I have extra time I do enjoy reading everyone's comments. For some reason though I cannot see anyone's today or yesterday. I hope they are accessible later on as I would like to go back and do some reading. This has been fun...too bad it's coming to an end. I remember those same wonderful things, only I always got one big beautiful Red Delicious apple in my stocking, the best breakfast treat ever... I made stockings when I got married, and one when each child was born. After 38 years, ours had to be replaced, but I still have them. Lots and lots of memories there! I love the traditions of Christmas. They bring us so close to people we are missing. Your boxes are looking awesome. I don't need anything, though. I was just given a room FULL of supplies. Don't know where I will ever put it all! I am really enjoying your stories (you have a talent for storytelling) and reading some of the comments every day. People are so interesting! Most of our traditions do go with food hand In hand. I don't remember any from my childhood that stick out. The traditions that I started about 5 years ago is that I let my kids open one gift from under the tree on Christmas Eve and we have hot chocolate. They really enjoy it. Wow! Those boxes keep on growing! We make our own traditions with our kids, as we come from different faiths, and don't have other family in the area. And yes, I have lots of scrapbooks to document all the fun! My sister made stockings for us, all 11 of us, including mom and dad. The rule was the stocking stuffer had to be under a dollar. My dad passed away we were young and my mom eventually married a great guy who brought 3 kids too the mix. As the family grew, My mom carried on the tradition adding new stiockings every year. One of my kids counted them up one year and there were 68 of them. Thankfully mom stopped doing it! We do it in our own families, but mom sure held strong to that stocking tradition for too long! I have a felt Advent calendar that my mom made when I was a kid (50 something years ago). It now comes out every December and I fill the pockets with candy for my teenagers. I hope that one of them will want it when they have a family of their own. When my sister had her first child, I recreated the Advent calendar so she could continue the tradition with her family. When us kids got older and had families of our own, Christmas Eve was always spent at my mom and dads. We would have a seafood dinner and @ midnight we got to open gifts. I have since carried on that traditions now that my kids are grown and have families of their own. Mom was a doctor and often had to work on the holidays, leaving little time for preparing extravagant meals. We often had our holiday dinners out or as take out. Since I don't like to cook, I have carried on that holiday tradition! Also, we often celebrate holidays a few days off the actual date to accomodate everyone's crazy schedules. Down the road from my family lived 3 old single brothers, who had nothing electrical in their house nor did they have a vehicle of any kind. So on Thanksgiving Day and Christmas Day my folks would make them a meal from ours and this had to be taken to them before we ate. Now I try to make up boxes of goodies to take to some of our neighbors and our daughter does the same for her neighbors. The one Christmas tradition that has been passed down in our family is the baking of shortbread. It just wouldn't be Christmas without it. We even have a secret of how to make it that's been sworn to secrecy! Another tradition that I started is a angel tree topper that I made for our family's first Christmas 41 years ago. When the kids and grand kids come over they always check to see that it's sitting in the top of our tree. Some years it needs some little repairs. Don't we all after 41 years? I fondly remember going to Grandma's house when I was very little and having gift exchanges with my cousins. I did'nt realize then that the grown ups didn't exchange gifts, b ut we were all together for the day and a big meal at noon. I carry on this tradition now with my own family, and hope my granddaughters have fond memories of our times spent together at Christmas. We always cut down our own Christmas tree - a cedar tree that we had to really search for to find a nicely shaped one. We also always made the 5 lbs. of fudge....YUM! Lovely layout. The boxes are getting better and better. Ever since I was a child I received a special Christmas Tree Ornament. (I still have all of them) I have continued this tradition with my children and now my Grand Daughter. Also, we always have had large family dinner on Christmas. The only tradition in my childhood was opening gifts on Christmas eve and then our Santa gifts would be under the tree when we got up in the morning. I did that tradition all during my kids growing up until my grandson came along then things were really changed. My son's wife wanted to travel at that time of year so Christmas is celebrated either before or after Christmas. My other son celebrates with us most of the time. Needless to say Christmas (which was my favorite holiday) has become one holiday that I do not look forward to. Too much stress. Making ravioli is our family tradition for Christmas. It is a lot of work but so worth it! Yum! I forgot to tell you how much I love your digi layout! What do you do with those types of layouts? At least with doing physical ones, my family look at them once in a while, I'm afraid that if I went digital, they would never been seen. Traditions.. well, we still put the same ornaments on the tree that we did 50+ years ago (plus a "few" new ones). A couple of years ago I did a Twelve Days of Christmas class at Big Picture and documented many traditions. My mom worked for a doctor so she didn't do much baking through the year, but at Christmas time she made cinnamon rolls and cookies and it was the best! I always baked with my kids and still do when they come home. They look forward to baked Amish oatmeal and blueberries on Christmas morning, along with fresh cinnamon rolls and lots of cookies! When our kids were little we lived in the mountains of NM and every Christmas Eve we all went ice skating, then drove around town looking at the farolitos (candles inside paper bags) that lit every street. By the time we got home it was time for bed and then Santa came! Really like your layout Diane and the tags look gorgeous. Thanks for the opportunity to win such a wonderful box of presents. No traditions from when I was a kid to keep unfortunately. Our traditions are gathered around just being together on the holidays and when the kids were little my husband dressed as Santa every year. I have scrapped some about them. Thanks for doing this, it's very kind of you! My Christmas traditions are activity related. I couple of years ago, I made a scrapbook page about our Christmas traditions. They're (mostly) ones I grew up with, and I suspect that when my sons are married and have children of their own, they'll continue our traditions. Growing up, Santa always put an orange and an apple in my stocking, and that's what I did for my sons, too. But one year, in a letter he wrote to Santa, one of my sons asked Santa not to put an orange in his stocking anymore! Hi Diane! The sun is shining here in Ohio. It's really cold but the sun helps! When my kids were little my son decided one Christmas morning that we should turn the furniture around so that we could all see the tree as we opened our gifts. We still do that 28 yrs later! Every year since I was a young adult...long time ago, I have read the Christmas story from the Bible at our family gathering. It's nice to take a moment and remember the reason for the season as a group. For me most holidays have specific foods and the smell when these are being cooked, serve to say "It's a holiday!" I usually have Christmas eve and do have a meal with all the trimmings and goodies. When I was a child, we always celebrated on Christmas Eve so we could go to grandma's on Christmas Day. We always took a drive around town to look at all the Christmas lights. And that was when Santa would come! Years later I realized that Mom always forgot something and had to run back in and that was when "Santa" came. Today, Christmas is more just spending time with family. And always cooking those special recipes - the one Grandma always made. I love your digital pages, I have not tried digital scrapbooking, but would really like to give it a try! Dang I hate it when I hit the wrong key and my message disappears. When our kids were little I made stockings for all of us. As the family grew I made more stockings even one for the dog. We hang the stockings on the stairs. Our youngest son and family come and spend the night with us Christmas Eve. We play games and read the Christmas Story. This year the 7 year old grandson read the story. Then they go off to bed. Mike my hubby and I get out all the presents and put them under the tree. We take down the stockings and fill them. They are placed by the fireplace. Morning comes with the smell of cinnamon rolls, coffee. hot chocolate and total excitement. Our oldest son and his wife come over for presents and huge breakfast. I have taken lots of pictures and started scrapping them. The word started is the key. Grandsons are 12 and 7. 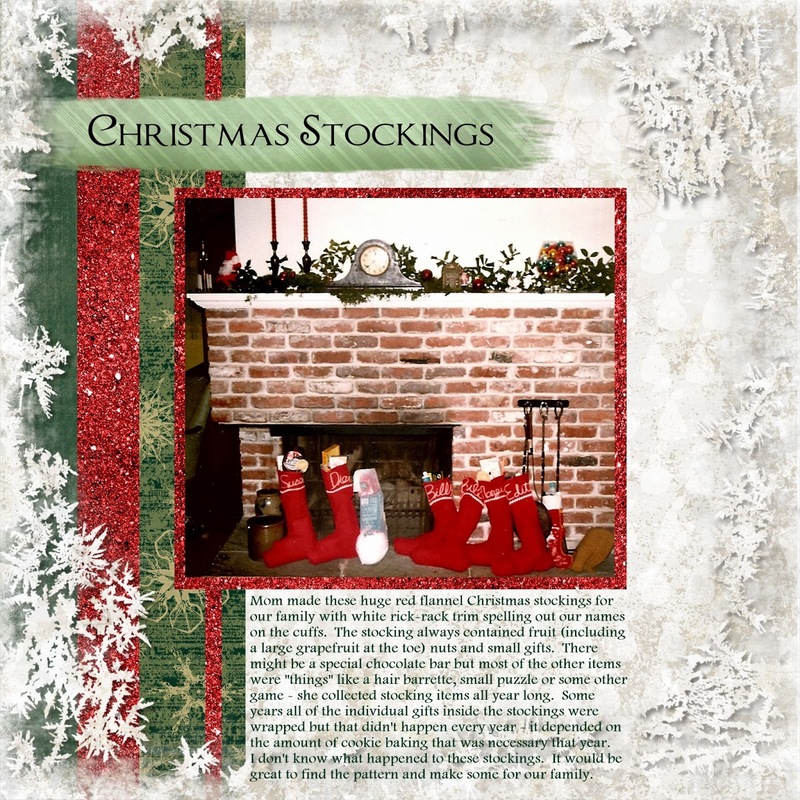 Your picture of the stocking on fireplace warms my heart just love it. One holiday tradition that I've carried on is to buy an ornament for my children every year. When they lived at home, they went with me to select one. When they married, I gave them all their ornaments. Now, I continue this tradition y buying or crafting an angel ornament each year. When I was young, we opened one gift on Christmas Eve, which was always PJs. I continued that tradition with my kids and now include my grandchildren. Of course, I have to get Christmas PJs for the grandchildren! As a child, Christmas was not a huge deal. We lived on a farm in northeast Ohio and there were 6 kids in the family. My mother milked the cows with my dad twice a day, and she was also a full time nurse working with the county health department. Our presents were few and were most likely just in a brown paper sack under the tree. We got things we really needed, which was a welcome change from the hand-me-down clothes we usually wore. My mother was a very "practical" woman - still is! We don't exchange gifts with my family members once it got to the point here's your video or bottle of wine, thank you for the video/wine you are giving me! I am fine with that. My husband's family goes CRAZY with expensive gifts, so I told him that whole scene is up to him. I give gifts to our children and now grand-baby, but that is it! Your page is so beautiful. We have stockings hanging, but we no longer put things in them. Our family is now so small and with no children it is not at the top of my list. Our Christmas dinner is where our traditions are carried on. My daddy's mother always cooked noodles to go with hen or turkey, so mama always fixed them too. My nephew, my husband, and my daughter love noodles so I always cook them. Fruit salad is a must apples, bananas, pecans, celery, and mayonnaise, my nephew loves beets. My mama always had those for him at every holiday. When she died I decided that he would always have beets at my table. Cornbread dressing is always anticipated! The best holiday tradition is being together for it. I would buy a handcrafted ornament at the craft store each year for each of my children. That way they had some ornaments when they set up their own home. I would usually include a new toothbrush in the stockings. We would have appetizers for Christmas Eve and just snack o all the good stuff that we never had time for the rest of the year. We would open gifts on the Eve and open Santa's gift on the morn, then go to the Grandparents for the big meal of turkey and all the trimmings. Great Memories! One tradition that I carried on for my children was getting a present of books on Christmas Eve. I was always so excited for Christmas morning and couldn't sleep, so my mom would give me a package of books to open so that I could read and fall asleep. I've always loved to read, so that was perfect! And it worked! Love your page! I love the holiday season and all the pretty things that accompany it! I tried to carry on some family traditions, but my husband wasn't interested, so my family traditions no longer happen. We don't even put up a Christmas tree anymore because I can't get my husband to bring it down from the attic (it's too heavy for me to move by myself). We used to do food and activities-based traditions at Christmas when I was a kid, but never took pictures. I have fond memories, but that's about all. Our Christmas tradition was to make Tamales and Rosettes, a lot of work, but it was all worth it Christmas Eve and morning. Some of us still attempt to maintain that tradition, but you know, nothing tastes as good as Mother's cooking. We always had Swedish meatballs, pepparkaka and spritz cookies. I don't make them much anymore but I have scrapbooked a few of the Christmas gatherings. I try to carry on the traditions, but it's getting harder the older I get. I decorate every room of our home with tons, it takes at least two weeks just to get it all up. Just so the family gets to see and enjoy the holiday dressed house. I've always loved the HUGE Christmas days that we had as a child and love it when I can have everyone over to our house for the festivities, but I'm getting so disappointed in today's adults and their give me my gift and leave attitude. As soon as we open gifts everyone packs up and leaves, there's no family time just greed! I've tried to get my husband to start a tradition of making each other gifts instead of the store bought gifts, my kids are on board his family says NO. I love getting homemade gifts, they are from the heart. Before I was married my family would always do the same thing for Christmas. Go to my Aunt's for Christmas Eve and then my Mom would have dinner Christmas Day. When I got married we spent Christmas Eve with his family and Christmas day with my family. Still got to see everyone. When my parents died and his parents died everything changed. We tried to carry on Christmas Eve, but the family grew and everyone spent it with their children. Not a bad thing, just different. Now I don't see my cousins very often. All of this took place before I started scrapping. My husband and I have been having a chili dinner with a bonfire for the past 13 years. We started it the year my Mother-in-law passed away. We get to see friends and family then. I scrap that event every year. I love to see who made that year. I sometimes go back to see who I missed. This is better than a wedding or a funeral for a get together. I'm afraid some holiday traditions with our family have gone by the wayside as our children prefer to start "new traditions" with their own children to suit their new lifestyles. A few food traditions may be carried forward but not much else. One tradition that I have continued had to do with the cornbread dressing. My father gave my mother a set of pyrex bowls for her first Mother's day after I was born. It was that classic set with 4 bowls, white on the inside with the outside of the bowl one red, one blue, one green and a large yellow one. The yellow bowl was the dressing bowl. I found a set of these bowls at an estate sale and the yellow bowl was the dressing bowl at my house just as it had been at my Mom's house. My Mom passed away a few years back and her set of bowls have joined my set so now I have two full sets and we still make the dressing in the big yellow bowl. I don't have a lot of traditions from my childhood that we carry on, but my hubby does. We always go to my in-laws house for Christmas Eve. We open family presents there and eat birthday cake for Jesus. We also let the youngest child in the family put Jesus in the manger. Additionally, my mother in law made my hubby and I stockings when we first got married. Shortly before my first daughter was born, she had a stroke but was able to put together a stocking for her as well. She passed away right before Christmas, and never met my second daughter. I got her fabric and the pattern for the stockings and made her one. I scrapbooked that story and take time to tell the girls the story each year. Loved the story about your Christmas stockings. When I was a young mother, I started my own traditions with my four children. They now carry on some of those traditions with my grandchildren, which is fun to see. One of our traditions is to go sledding on Christmas Eve and then come home to a homemade soup supper - always at least 3 kinds of soup! I haven't done any scrapbooking at all for myself - only for my children and grandchildren - but you've inspired me to give it a try with some of my old photos. We had Christmas tree parties when I was a child. We made cookies, drank cocoa and decorated the tree. My adult children still enjoy this tradition and my granddaughter loves it! And I have scrapped some of our big parties!! When I got married a friend of mine gave me a Department 56 building and that just started the entire process. Now each year even though my husband is no longer with me. I carry this tradition on and he use to collect model trains. I don't add many new buildings but I still carry on with setting them up each year. I have one village on his old roll top desk and one on plywood that take a lot of space. He has not been with me since 2001 but I am still doing this tradition. We were married for 31 years and I have continued on for 12 and will continue this as long as I can. Love the items in the boxes and good luck to everyone. I was born on Labor Day in 1972. On Dec. 2nd was my grandmother's Birthday...she went into the hospital that day...she passed away on Dec.14th. I only knew her for less than 3 months! I grew up with my mother doing all the holiday decorating on Dec. 2nd to honor her and her birthday. I have carried on that tradition. Every Dec. 2nd we decorate. I also name my 1st child after her. We always open presents on Christmas morning. The youngest plays Santa and passes out presents. Everyone gets one present then we go in order and open that one. We ooh and ahh then we go in order to open the next present. We usually take around two hours or more to open our presents. My grandson was at someone's house this year and told me he hated how they just tore into their presents and no one knew what anyone got. That made me beam thinking that he will start his own tradition of slowly opening presents when he gets married. I love Graphic 45 papers. I come from a large family and the best thing about Christmas as a child was the pile of gifts around the tree. We would take turns trying to find our gifts because they were all mixed up and it was like a treasure hunt trying to find your own. Once you found one of your own it was time for the next one to look. We didn't get a whole lot, but the treasure hunt was so much fun. Now that I have my own family I have started several other traditions; ornaments every year; cookie baking, and card making. A favourite tradition, when I was a child, was eating ripple chips with onion dip first thing on Christmas morning. That is one I have carried on with my own family. Ones we have created are going out on Christmas Eve to see various light displays. Then we return home and our kids get to open one gift, which is always new pajamas. Stockings are always opened first, then gifts are passed out. Our children each open one at the same time. A final tradition is no matter your age, you always receive gifts from Santa and any household pets. We have Christmas stockings and open them Christmas morning. My sons latch hooked their stockings as little boys and are still using them at my house. I made a Joy stocking one year. Each family member would write a note to a specific family member (per a chart). The note would describe something they liked about the family member. We read the notes on Christmas Eve - privately or publicly - a personal decision. Some from the kids were hysterical. Good morning! I love your Christmas layout! We like you had special stockings and my Mom made them as well, just as your Mom did! 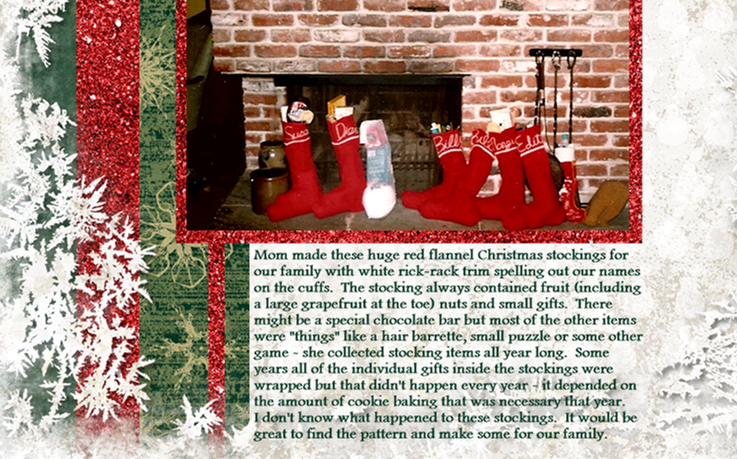 Ours were knitted and each stocking had our name knitted into it as well as different items. Mine had a wreath with wood beads for berries and sequins and stars on my Christmas tree. She made those for everyone, always the traditional gift your first year into the family. Now that she is gone there is no one to continue the tradition of new knitted stockings, which makes these so priceless to us. Diane, ours were always filled with nuts and oranges! The problem with a knitted stocking? It will stretch so Mom always had to find more to fill it! LOL! Hope you stay warm during the upcoming snow, here in Indiana we have broken the snowfall records and expecting another big storm Sunday into Monday! I don't know if it is a tradition, but my Dad used to always be in charge of making the egg nog. He'd make quite a mess of the kitchen but the egg nog was the BEST! Now that he is gone, it is my "tradition" except that with 2 grown boys, I have to start making it days before and am still making it until New Year's! Now that I think about it, most of our "traditions" revolve around food...!! My parents weren't big on traditions, so my husband and I made a point of establishing some when our son was born almost 13 years ago. I hope we have created lasting memories for him that he will want to carry forward with his children! Neither my hubby or son are motivated by food, so I've been robbed of traditions involving cookies, cakes, cinnamon rolls, pancakes, you name it! Probably for the best... I'm only 4'11" and I would probably be as wide as I am tall if I associated food with holidays/events ;-) I have scrapbooked some of our traditions shared over the years, though I still have more to do. Maybe when our son goes to college I will have enough time!!! My husbands family always opened gifts on Christmas eve and my family did it on Christmas day and we still do it the same way! As a child, my brother, sister, and I always tried to get our parents to let us open our gifts on Christmas Eve (Dad was of German descent), but we never talked them into it! When my children were little, we started including stockings for all of us. That tradition continues today with my boys' own families. When I was a child, we really didn't have any special traditions. As a mom now, I do. I like to have a special dinner with my children on xmas eve (then they can go and spend time w/friends). Then we wait for everybody to be awake on xmas day to open presents. Later we all head to my brothers house to exchange presents and hang around together. This is really special for me. Thanks for all the goodies that are going in the boxes. No family traditions aside from getting all family together and just enjoying our time together. My grandmother use to love when we all got together on Christmas Eve. The smile on her face was always priceless. I don't have any family traditions from my own childhood, but I have started one with my daughter. I don't wrap her gifts until Christmas eve and I set them up in a display just for her for Christmas morning.. As my family grows, I plan to keep this going & hope my children will do it with their children. We also do Christmas breakfast at our house so we have the evening to spend with our extended family. We celebrate Christmas Eve with my side of the family, and our tradition is to have a Chick-fil-a nugget tray for dinner. With Easter just around the corner, our tradition is to Color eggs the night before for the Easter bunny to hide along with his own colorful eggs he brings. The next morning after the eggs are found we play "Crackie" . Basically you take the hard boiled egg and smash the egg with your opponent's egg, whose ever egg did not crack is the winner and they would move on to the next person to crack their egg. The last person with a non cracked egg is the Winner ! Sounds silly to type it but it was really fun with 7 brothers and sisters growing up .. until someone got to aggressive and made the others cry.. LOL but we would all gear up to play every year no matter what. Now I play with my daughter even though she is older we still need to carry on the tradition . We always open our gift on Christmas eve. I don't remember any Christmas traditions from my childhood but with my own children they always got to pick a new ornament so when they had their own home they would already have ornaments for their Christmas tree.